We offer three suites within French Fields. All are sunshine facing with glorious views in every direction ... across lavender fields and olives to neighbouring vineyards and out to the beautiful Marlborough ranges. Step out to enjoy from your private courtyard or balcony. To ensure your comfort the suites are furnished with quality beds and linen, feather pillows, bathrobes and towels. 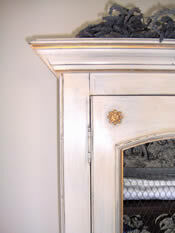 The furniture style is French Provencal. Your bathroom has a heated floor and towel rails; hairdryers and French Fields toiletries. All suites have air conditioning/surround heating. Your Wi Fi internet access is free and you have free use of the guest laundry. There is a guest barbeque in the pool courtyard and all suites have dining tables and dinnerware. 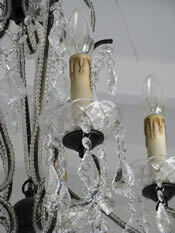 We hope you'll be enchanted by Petite Maison. 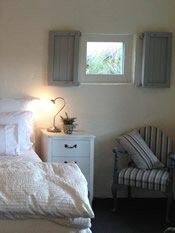 ...its shuttered windows; its private balcony; its high beamed ceilings; its soft country colours; its luxury king bed, comfortable seating, dining area and armoires that store your entertainment centre and your dining needs (microwave, Espresso coffee machine, toaster, kettle and fridge). Enjoy the French Provencal contrasts of tone and texture... a blend of classic design, highlighted with objects of interest. 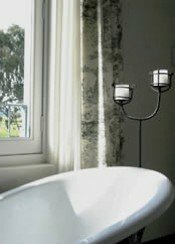 Your ensuite has a spacious walk in shower, (choice of shower heads) A delightful little French window frames the view to a hillside of grapes. Petite Maison is privacy and charm.. with French doors that open onto your own balcony. ..a perfect place to watch the sun go down. Here you can enjoy breakfast... or if you prefer, it can be served at your dining table ... by the pool... in the courtyard ... or the French Fields conservatory. “If you want to think beauty, you need to see beauty. 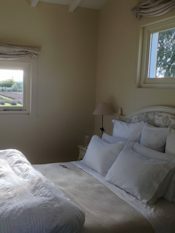 This boutique suite nestles amongst the lavender in the French Fields court yard. It features separate living areas with high beamed ceilings, shuttered windows, softly muted colours, and chosen provencal pieces. French doors open to a a private courtyard. The bathroom features a large walk in shower with rain head option, underfloor heating and heated towel rails. Your generous breakfast can also be served in your own private courtyard amongst the lavender... by the pool or in the French Fields conservatory. The in-house accommodation includes a separate intimate guest sitting room where you can enjoy a full entertainment centre, deep sofas and a cosy fire. The peaceful upstairs Queen room has stunning views from shuttered windows. The decor and bedding is softly romantic. The chic bathroom has up- to -the minute fixtures including a rainhead choice of showerhead;heated towel rails; and luxury bathing products. Breakfast is served in your private conservatory or by the pool if you prefer.